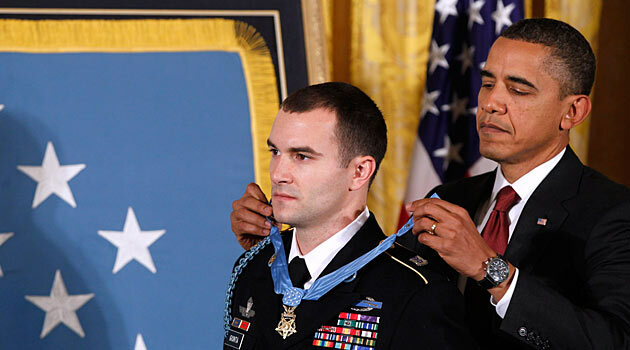 President Obama today awarded the Medal of Honor to Army Staff Sergeant Salvatore Giunta for his heroic actions in the Korengal Valley of Afghanistan in October 2007. "It is my privilege to present our nation's highest military decoration, the Medal of Honor, to a soldier as humble as he is heroic: Staff Sergeant Salvatore A. Giunta," the president said in an East Room ceremony. He went on to say that he wanted to "go off script" and point out that "I really like this guy." "We all just get a sense of people and who they are, and when you meet Sal and you meet his family, you are just absolutely convinced that this is what America is all about," he said. "And it just makes you proud. And so this is a joyous occasion for me -- something that I have been looking forward to." Giunta, a 25-year-old Iowa native, was given the award for repeatedly running into enemy fire to save American lives and rescue a fellow soldier from the Taliban. "It had been as intense and violent a firefight as any soldier will experience," Mr. Obama said. All nine of the Medals of Honor awarded previously for conduct since the end of the Vietnam War have gone to members of the military who fell in the line of duty, including three awarded by Mr. Obama. It has been almost 40 years since the award was given to someone who was not killed in action. Mr. Obama described Giunta as "a low-key guy, a humble guy, and he doesn't seek the limelight. And he'll tell you that he didn't do anything special; that he was just doing his job; that any of his brothers in the unit would do the same thing." He went on to say that while Giunta "may believe that you don't deserve this honor," he had been recommended for it by his fellow soldiers, including a commander who compared his actions to those of World War 2 hero Audie Murphy. Murphy, Mr. Obama noted, "famously repelled an overwhelming enemy attack by himself for one simple reason: 'They were killing my friends.'" Mr. Obama said Giunta, his company and the other members of the military are shouldering more than their fair share of their burden as Americans. He lauded them for their decision to volunteer to serve their country. "In an era when it's never been more tempting to chase personal ambition or narrow self interest, they chose the opposite," the president said. Giunta's actions came after an ambush by at least a dozen Taliban fighters, who fired at the American soldiers from two sides simultaneously at close range, pinning down the entire unit in an instant. He was hit twice while running into enemy fire to pull his fellow soldiers to cover, with one shot hitting his bulletproof vest and another shattering a weapon. He likely saved the life of one soldier and kept another from being taken by the Taliban. Giunta, who is now serving at a U.S. base in Italy, told "60 minutes" he isn't comfortable with being called a hero. "I'm not at peace with that at all," he said. "And coming and talking about it and people wanting to shake my hand because of it, it hurts me because it's not what I want. And to be with so many people doing so much stuff and then to be singled out - and put forward. I mean, everyone did something. Okay, someone wrote about this, and then someone else approved it. And then a story was told and handshakes were made, and then sooner or later, I'm talkin' to the president of the United States. I don't see how that happened." "This is only one moment," he added. "I don't think I did anything that anyone else I was with wouldn't have done. I was in a position to do it. That was what needed to be done. So that's what I did." Shortly after receiving the award, Giunta, his wife at his side, called today's ceremony "truly an incredible experience." He said that although he's the one wearing the Medal, it represents all those who have served in Iraq and Afghanistan. Giunta added that the moment was bittersweet and that he would give back the Medal in a second to have his fallen comrades back with him. During the ceremony, Mr. Obama asked the families of the two soldiers killed on the ambush -- Sergeant Joshua Brennan and Specialist Hugo Mendoza -- to stand. Brennan was the soldier who Giunta kept from being taken by the Taliban, and the two were close friends. Also present and recognized at the ceremony were other members of Battle Company 2d of the 503d of the 173d Airborne Brigade. "We're all in your debt," Mr. Obama said. "And I'm proud to be your Commander-in-Chief."